[The people at the last synagogue—the place for learning about God—had just tried to kill Jesus by throwing Him off a cliff. 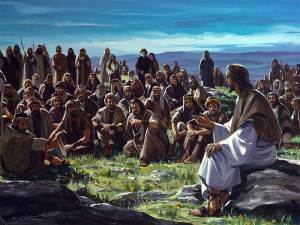 But Jesus did not allow this response of the people to stop Him from His mission. He goes to another synagogue to continue to be Who God the Father sent Him to be, and to continue to do what God the Father sent Him to do. WHAT BRAVERY! WHAT COURAGE! WHAT DEVOTION TO GOD THE FATHER’S WILL!!! What has God called YOU to be, what has God chosen YOU to do? Acts 20:21-25: 21 I have declared to both Jews and Greeks that they must turn to God in repentance and have faith in our Lord Jesus. 22 “And now, compelled by the Spirit, I am going to Jerusalem, not knowing what will happen to me there. 23 I only know that in every city the Holy Spirit warns me that prison and hardships are facing me. 24 However, I consider my life worth nothing to me; my only aim is to finish the race and complete the task the Lord Jesus has given me—the task of testifying to the good news of God’s grace. When is the last time that any of us cried out to God, not to give us more stuff, but to give us faith in Him LIKE THAT? Faith to be more focused, determined, submissive to God? [As I referenced two weeks ago, James 2:19 tells us that even demons believe in Jesus—they know He is not just a man, they know He is not just a carpenter, they know He is not a fairy tale, they know He is God Himself. They know this is True but they are not HAPPY about this Truth—they cringe/shudder at this Truth. What do you need Jesus to free you from? What prison has you closed in on all four sides, with what seems to be no way out? Now I’m not saying that Jesus was busy busy busy filling up His days with endless/constant activities that seem noble but actually wind up being a distraction from true purpose/mission—not at all! That’s the American Way, NOT the Biblical Way. In another couple of verses we will see Jesus model for us what real rest/refreshment comes from, and it is not from just doing more/working harder. But here in verse 38 we see Jesus not passing up an opportunity to make a real difference in someone’s life simply because He had already done so to others earlier in the day. [Again, AT SUNSET—from morning through the end of the day!—Jesus continued to be focused on fulfilling His mission, accomplishing His purpose given to Him by God the Father. Are we focused on God’s mission and purpose for our own lives? As hard as all of us have worked over the past week, as busy as we have been with good things, have we been focused on the best things that God has prepared for us? But it’s tough to get to know God—I can’t see Him! True, we cannot usually experience God with our five senses, but we can STILL know Him deeply/personally if we are willing to work with Him to learn. But are we? We won’t have time to truly pursue God AND to pursue other things. What is more important to us? God promises that if we pursue Him WITH ALL OUR HEARTS we will find Him. Jesus often went to lonely places and prayed to get to know His Father better; we need to be willing to do so as well. In our final few moments together this morning, I want to focus on one major theme of this passage—Jesus’ use of both actions AND words in accomplishing His mission. Over the last 20+ years in America there has been a huge swing amongst Christians—we seem to be HYPER focused on doing good deeds in the community but seem to have lost our focus on speaking good words of Truth. Actions without words: like serving a bowl without the soup—there isn’t much in it to truly nourish. Jesus did BOTH—actions AND words—and so He wants us to do the same. May we please stop quoting, “Preach the Gospel at all times, use words when necessary”? This is not in the Bible, yet many Christians without realizing it build our daily/practical Christian lives upon it. Jesus said to build our lives on HIS Words, not on the well-intentioned but imperfect words of other fellow Christians. But my good deeds help me to build trust with others so that I can eventually tell them about Jesus with my words!